I’m part of the team building the ‘Recruit an apprentice/trainee’ service. 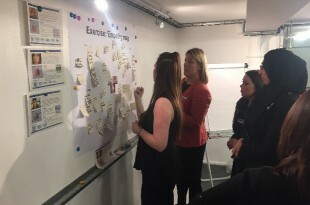 It will allow training providers to advertise apprenticeship vacancies and traineeship opportunities on the Find an apprenticeship (FAA) service and manage applications. ‘Recruit an apprentice/trainee’ will replace the existing Apprenticeship vacancies (Av) management service used by providers. Training providers use Av to list apprenticeship vacancies and traineeship opportunities on FAA on behalf of an employer. The training provider reviews any applications and passes the most relevant onto the employer. Once the employer has decided who to appoint, the provider lets the candidates know the result of their application. As part of our ongoing user research, we wanted to understand more about how providers manage candidate applications and how their use of the FAA service impacts candidates. We thought a workshop with a small group of Providers would help us do that. 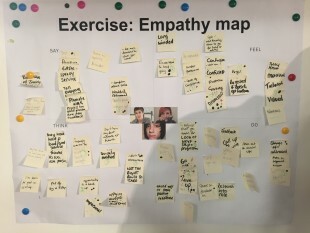 An empathy map is a tool that helps us develop a deeper understanding of our users, but in this workshop, we used a map to encourage one user group (providers) to empathise with a different user group (candidates). What do apprenticeship candidates say/think/feel/do about the management of applications and feedback they receive? At the end of the task, we asked the providers to review all the ideas that had been added to the map, and to vote for those they felt were most important. The ideas with the most votes included candidates feeling that the application process was impersonal, and candidates saying negative things about a provider/employer. The exercise gave us a better understanding of how providers view and work with candidates. It also helped us generate ideas on how to improve the service to benefit both sets of users. One of the most interesting parts of the day was the group discussion, which we used to help us understand more about providers’ offline processes. How do you respond to candidates? How/when do you give candidates feedback? The general response was that the current Av system doesn’t offer the tools necessary to communicate effectively with candidates. The providers didn’t feel this was necessarily a bad thing though - they preferred to give candidates feedback personally, via phone, email or letter. We are now looking into whether we should add a facility to Recruit an apprentice/trainee that will allow employers and providers to give detailed, personal feedback through the service. This will make things easier for employers and providers, help ensure all candidates get feedback, and enable the SFA to track that candidates are given the feedback they need to help them on their apprenticeship journey. We rounded off the day by demonstrating the Recruit an apprentice/trainee service and how it will work with the Find an apprenticeship service. It was the first time the workshop participants had seen it, and we were pleased to discover that many of their issues with the current service were already being addressed, with more progress to be made before the beta launch! Carrying out extensive user research, and letting user needs drive our design process has paid off. Like all good user research sessions, the workshop answered many of our questions and created some new ones! We’ll be feeding what we learnt into the design of the Recruit an apprentice/trainee service. We’re aiming to launch the beta version of Recruit an apprenticeship this summer and we’d love to hear what you think.